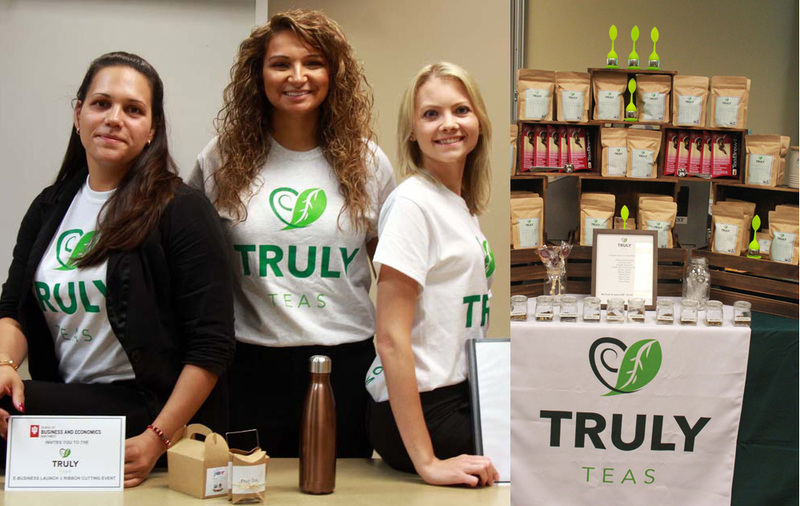 Three women who graduated with their Indiana University Northwest business degrees in 2018 officially launched their online beverage business, Truly Teas, in the presence of their School of Business and Economics (SOBE) peers, mentors, and supporters at an event in August. While successful entrepreneurs are bred each semester at IU Northwest’s business school, this endeavor is unique, as it is being celebrated as the School’s first exclusively online business launched directly from a class project. Hearty applause surrounded the women as they ceremoniously clicked the virtual button to officially launch their company website at trulyteas.com. Truly Teas’ mission is to “provide customers with the best-tasting, all natural, USDA Organic and Fair Trade Certified teas for their everyday lives.” The goal is to be as eco-friendly as possible and all packaging is 100 percent recyclable. They sell flavors such as lemon ginger, coconut chai, mint and mango peach, along with sleek tea essentials, like tea infusers and stainless steel bottles. Demi Kolintzas, 26, of Schererville; Lindsey Liesenfelt, 26, of Cedar Lake; and Branka Vukotic, 33, of Highland, came together as strangers a year ago in Yllka Azemi’s Marketing Strategies class in the fall of 2017. They never imagined their assignment to create a marketing plan would materialize into an actual company just a year later. As a way to amp up the game and push the students to give their best to the project, Azemi made the final project a class competition, judged by the SOBE faculty. Not surprisingly, the Truly Teas group won first place. Azemi said that several days after the semester ended, she received a visit from the young entrepreneurs, who had decided to make their hypothetical tea business a reality. For example, the company needed to design a logo, build a website, craft a mission and vision statement, obtain proper certification and more. Because no stone was left unturned for their official launch, the women are already poised for innovation and growth, such as exploring a subscription option. Vukotic, a full-time mother of three, said that while Azemi’s class competition served as the catalyst, it was truly the culmination of their entire business school education that gave them the tools to launch the venture. Helen Harmon, assistant director of graduate and undergraduate programs, praised the women for venturing into territory that is new and somewhat uncharted for new graduates.